Context: Right-clicking on an R-group definition label. Ungroup: The R-group definition list in question is deceased, but its elements will remain on the canvas. Duplicate: Takes a copy from the R-group definition in context. Atom Properties: opens the Atom properties dialog window. Bond properties: opens the Bond properties dialog window which contains bond types and query properties. 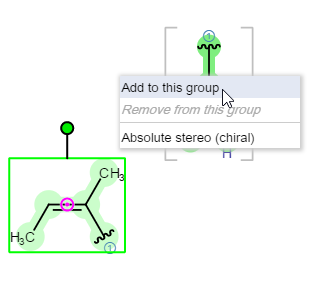 Absolute stereo (chiral)*: Sets the "Absolute" chiral flag on every structure on the canvas, indicating that the molecule(s) represent(s) a single, well-defined stereoisomer. Right-click on the label of the R-group definition. Add to this group: The selected molecules are appended to this particular R-group definition. Remove from this group: The selected fragments are removed from the R-group definition in question.